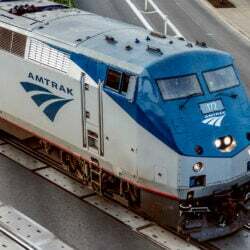 Residents from the Regional School Unit 4 towns of Sabattus, Wales and Litchfield have given preliminary approval to the spending plan even as others signal discontent. 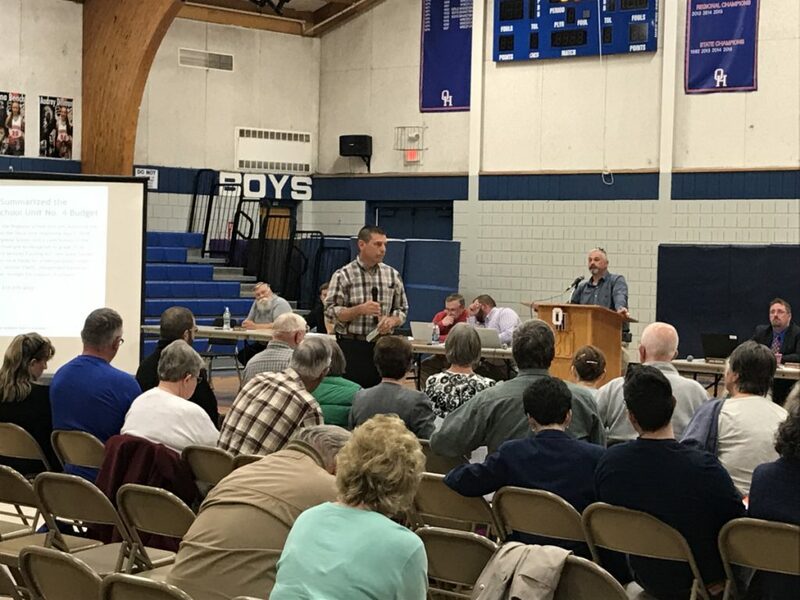 WALES — After voters in Regional School Unit 4 narrowly passed a proposed $19.17 million spending plan at the district budget meeting Wednesday night, a Litchfield selectman is warning that the proposal might prove too unpopular for voters in his own town to approve at the ballot box next month. Of the three towns in RSU 4, Litchfield is the only town where taxes would increase under the budget proposal. The other towns, Wales and Sabattus, both would pay less. At the meeting on Wednesday night, Mark Russell, chairman of the Litchfield Select Board, warned that the discrepancy could inspire some of his fellow residents to try to break away from the school district, which was formed nine years ago. 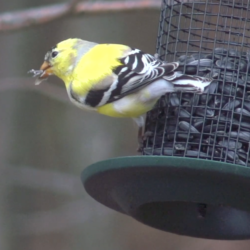 That statement came just two days after the Litchfield selectmen passed a resolution urging residents to vote against the $19.17 million proposal. The meeting on Wednesday night marked the first of two steps in the process for approving the district’s budget. 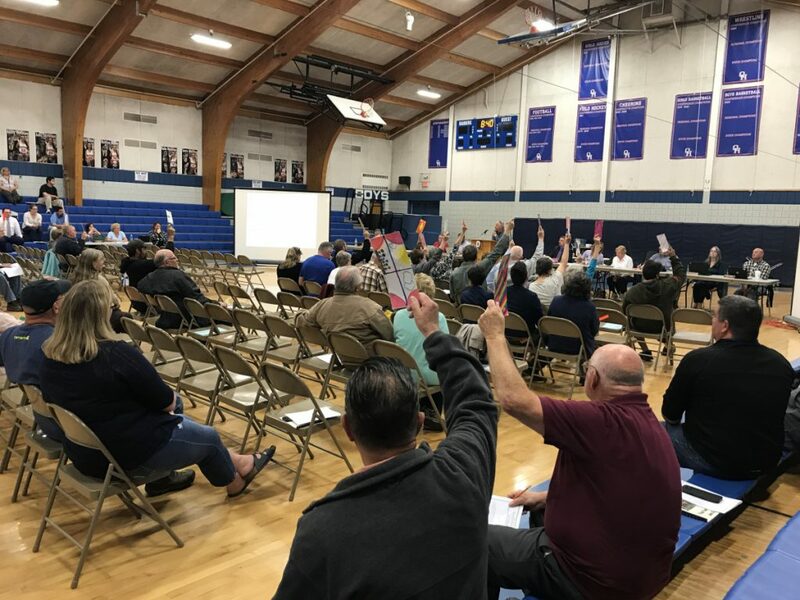 Of the roughly 50 voters who attended the meeting, more than half supported the proposal, which is up $355,984, or 1.89 percent, from this year’s $18.81 million budget. The proposal includes funds for a new school resource officer and a payment for the new roof on Oak Hill High School — a project that was partly funded by a state grant. With its approval on Wednesday night, the spending plan will now be sent to voters on June 12 and must be approved in all three towns if it is to take effect. The unpopularity of that proposal stems from the fact that Litchfield’s total local tax assessment would increase 0.74 percent to $3.57 million, while both Wales and Sabattus local assessments would drop. In Wales, it would drop by 0.47 percent to $1.18 million. In Sabattus, it would drop by 2.32 percent to $3.198 million. Under the proposal, the local property tax rate for Litchfield residents would increase by $7.39 on a $100,000 home, according to figures in RSU 4’s annual report. In Wales, the rate would decrease by $4.75 on the same home. In Sabattus, the rate would decrease by $26.23 on the same home. Litchfield has fewer students than Sabattus, but the reason it would owe more has to do with the state’s school funding formula, which is based heavily on tax valuation. Because Litchfield has much lakefront property, its overall tax valuation is higher, so the state requires it to pay a greater share of the district’s costs. At the district budget meeting Wednesday, Russell criticized the state’s formula, which has pushed more of the funding for schools away from the state and onto RSU 4 towns in recent years. That shift was one reason former superintendent James Hodgkin cited for leaving his post last year. But Russell also said the school board in RSU 4 could lessen the blow to Litchfield taxpayers by changing its own formula. Two years ago, the district held discussions about such a change, but nothing came of them. Earlier that year, Litchfield taxpayers voted down two budget proposals before approving the third one. Russell proposed removing about $66,000 from the budget proposal, because he said that amount would ensure that none of the three towns saw their taxes increase, but he couldn’t get enough votes for that proposal. 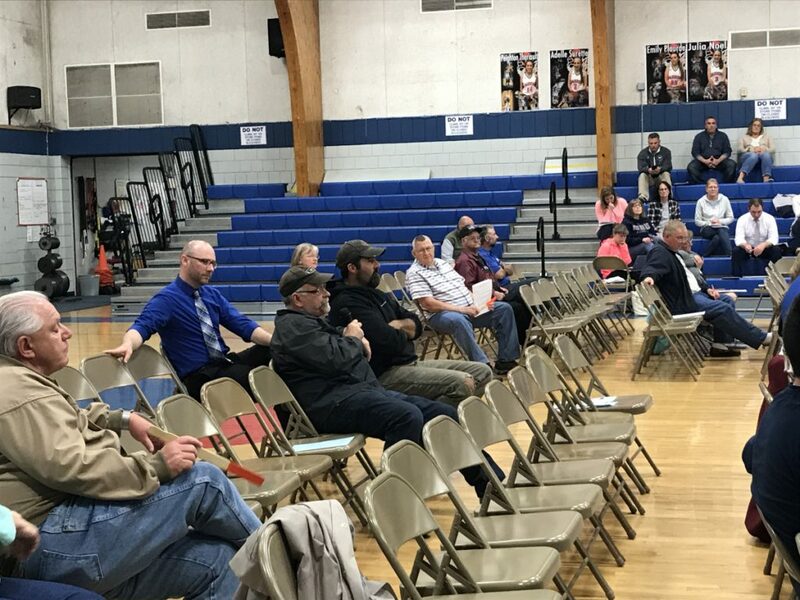 Not all the Litchfield residents who attended Monday’s meeting said they couldn’t support the budget. One of them, Jessica Childs, sits on the RSU 4 board and said that she would try to propose changes to its funding formula. In the meantime, she said that voters should vote for the budget. But it’s not clear whether board members from Wales or Sabattus would be willing to change the funding formula, so that more weight is placed on how many students come from each town. Robert English, a board member from Wales, pointed out that much of the discrepancy in the three towns’ tax obligations is related to the state formula. Based on his own research, English also said that many other towns use the same local formula as RSU 4 and that he wouldn’t support any changes.